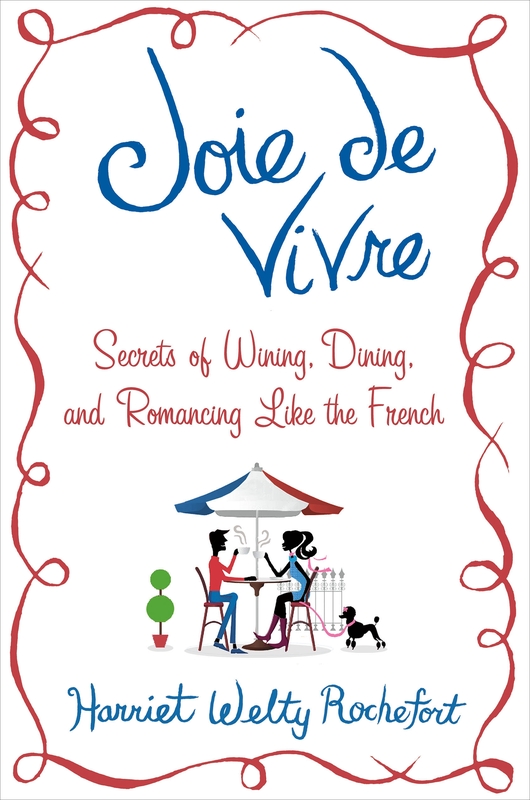 Q & A with Harriet Welty Rochefort, author of “Joie de Vivre” and other books about the French by Janet Hulstrand, writer, editor, writing coach, and teacher of writing and of literature. This interview appeared on Janet’s blog, Writing from the Heart, Reading for the Road. Harriet Welty Rochefort grew up in Iowa, earned degrees from the University of Michigan and Northwestern, and first came to France in 1967. She met her husband, Philippe, in 1971 and has lived in Paris ever since. Harriet is a former professor of journalism at the Institut d’Etudes Politiques de Paris (Sciences Po), and a speaker, freelance journalist, blogger, and the author of three books about France and the French–“Joie de Vivre: Secrets of Wining, Dining, and Romancing Like the French,” “French Fried: The Culinary Capers of an American in Paris,” and “French Toast: An American in Paris Celebrates the Maddening Mysteries of the French,” which Diane Johnson, author of “Le Divorce,” hailed as “the gold standard of books about the French.” All of her books have been published by St. Martin’s Press. A French-American dual citizen, Harriet lives with her husband in a garden apartment in the 20th arrondissement, which she says is “one of the last areas in Paris not to have a Zara, Sephora, or H & M.” She is currently finishing her first novel, which takes place in France during World War II. Harriet recently took the time to answer my questions about her work and her life in France via email. Janet Hulstrand: You grew up in Iowa, and first came to France on a study abroad program, right? What year was that, and what do you remember about what that was like? What was most surprising (or even shocking) thing about life here to someone arriving fresh from the Midwest? What was most attractive to you about French culture? Harriet Welty Rochefort: Unlike many who came to France as young people, I didn’t come here on a study abroad program. I had always dreamed of going to France and simply bought a one-way ticket after graduating from the University of Michigan in 1967. I wasn’t even a French major but I managed to fake French well enough that people would chat “at” me, which enabled me to improve. Actually, I had taken a trip to France while at university and was smitten with Paris and intrigued by the French. What was surprising to me was how small everything was (streets, cars, people, portions), and how beautiful everything was. I thought I had stepped into an Impressionist painting. I adored going down the Seine in a bateau mouche. I adored not knowing what the French were talking about, but guessing by their hand gestures. I found them so expressive. The smallness of things continued to strike me: in my latest book, Joie de Vivre, I have an entire chapter called “Small is Good: Les Petits Plaisirs.” In it I discuss les petites boutiques, les petits détails, les petits fours, un petit moment, and all kinds of other good things that are petit. Small, in France, is good! JH: What is the biggest misconception Americans have about the French? HWR: The Americans think the French are rude, and that the French don’t like them. The French can be very rude and it’s because they want to be, but it isn’t targeted at Americans. They are much ruder to their compatriots than to foreigners. As for liking Americans, all you have to do is look around you when in France and see how everything American is a big deal. The French have adopted brownies, hamburgers, brunch, food trucks, casual Friday, musical comedies and a host of other American things because they like to emulate Americans. They also unfortunately have emulated us on political correctness but it’s probably not as bad as in the States. This is not to say that all of the French like Americans. But I would say that a majority of them do. Hey, they even marry them! I belong to an organization of American women who are married to French men – there are 600 of us and that’s just Paris and the women who are in that organization. Think about all the others! JH: What are the most common misconceptions among the French, about Americans? HWR: The French think that because we call everyone our “friend” that we are insincere. They make a distinction between their real friends and their acquaintances. I keep telling them that we do this as well, but I don’t think they believe me. They also think that because we call the boss “Joe” or “Debby” that there’s no hierarchy. It’s a little more complicated than that. JH: And while we’re at it, what is the biggest misconception both Americans and the French have about Midwesterners? HWR: Actually, I’d say that the French have fewer misconceptions about Midwesterners than Americans do. Americans think that Midwesterners are unsophisticated louts, and don’t hesitate to say it. I guess political correctness does not apply to Midwesterners. JH: What do you still miss about life in the U.S., if anything? JH: What do you think you would miss the most about life in France were you to no longer live here? HWR: I wouldn’t miss the pollution in Paris, that’s for sure. I would, though, miss something that is unique to France-its astonishingly different regions which you can get to so easily on those splendid fast trains. La Bretagne, l’Alsace, l’Auvergne – just pronouncing the names makes me want to hop on a TGV (rapid train) for a total change from Paris. For the record, I have visited every single region in France. I would also miss the cafés, les petites boutiques and les petits détails of life, the lifestyle and style in general. The French attach a great deal of importance to style, to the way things look, to the way things are presented, to form, and I like that. I wrote about this subject in “Life as an Art Form,” one of the chapters in Joie de Vivre. JH: You are married to a Frenchman and have two children who have been raised entirely in France. How did you approach your children’s education, both formal and informal, linguistic and otherwise, in terms of their bicultural heritage? HWR: I always spoke English to my children even when they inevitably answered me in French. I thought it was important for them to be able to speak with their American family. We took them on trips to the U.S., especially to see family in Iowa, Chicago, and Arizona. Neither opted to go to college in the U.S. though. They had been to French public schools and were used to French education. I think they are a nice combination of French (but they are not as formal as the formal French) and American (but they are not as relaxed as relaxed Americans). JH: How do they identify themselves? HWR: They generally say they are French. Then they might say they have an American mother. JH: Do they feel half-American? Or just like the children of an American parent? HWR: Frankly, it’s hard to tell. They don’t like to talk about the subject, especially when people ask them whether they feel more French or more American. It’s kind of like asking them whether they prefer their mother or their father. I think they are proud of having a French father and an American mother, and that they like the blend. One of our sons lives in Montreal, which with its mix of English and French, is perfect for him. The other lives in Paris. He’s an author and writes in French but he also translates books from English to French. Having two languages is definitely an asset, and in today’s world it’s even becoming necessary to have three. JH: You are the author of three nonfiction books about France and French life. But I understand that you are in the final stages of completing your first novel. Can you tell us a little bit about this work? What has been most challenging about writing fiction? And when will we be able to read this book? HWR: I am indeed in the final stages. It is a historical novel set in France during WWII. Fiction for a nonfiction writer is a bit like playing guitar for a pianist, I would imagine. It’s the same field but you need different skills. I’ve had to hone skills I never had to use, or use in such a sustained manner, in nonfiction – set scenes, create dialogue, wrestle with a plot. It’s fascinating. As to when you’ll be able to read it? When my agent decides she likes it, shops it around, and finds a publisher who is enthusiastic. That is really the final part of the process. And after three books, I find that I am more concerned about the process than the finality. Of course I hope my agent will like it. Of course I hope readers will like it. But I didn’t think about that when writing it. I just focused on the immense challenge of creating a fictional world, something I had never done before. JH: What are your favorite things to do in Paris, and some of your favorite places? What do you recommend for visitors to Paris when they come? (What should they be sure not to miss?) And what would you to say to encourage those who might hesitate to come to Paris these days, that they should come? HWR: I love to hang out in cafés! I love the Jardin des Plantes, the Passage Vivienne, the Eiffel Tower, Paris in the early morning when almost no one is on the street, Paris at dusk, Paris along the Seine, all the “jardins” and museums and places of beauty. Of course visitors should hit the high spots, the Tour Eiffel, the Arc de Triomphe, the Invalides, a ride down the Seine, Versailles. To those who hesitate to come, I would say “Don’t worry.” There are evil people everywhere in the world, including in the States which has had its share of terrorist attacks and shootings by Americans with guns. I would tell them to take the advice of the U.S. Embassy, which issues regular bulletins encouraging visitors not to draw attention to themselves, not to gather in public places which could be targets, etc. Take those precautions, but don’t deprive yourself of a trip to one of the world’s most beautiful cities. I feel lucky to live in it every day, lucky to have the history of Paris surround me in its buildings as I walk. The charm of it, the sheer beauty, the idea that you can learn something new about art and history just by being here, has never worn off. Janet Hulstrand divides her time between the U.S. and France, where she offers writing workshops in Essoyes, a beautiful little village in the Champagne region. She is currently leading a book group at the American Library in Paris, and in January will be teaching “Paris: A Literary Adventure” for the Queens College (CUNY) Education Abroad Program. This entry was posted in Uncategorized on October 31, 2016 by harriet.welty. Sorry to toot my own horn but if I don’t do it, who will? Below is a lovely review of my third and latest book, Joie de Vivre, by John Pearce, author of the intriguing mysteries Last Stop: Paris and Treasure of St. Lazare. John’s third book is scheduled for publication in mid 2017; you can find his blog at http://parttimeparisian.com/ Phrases in bold in text below are mine.